So, turns out the pterodactyl was a darling. She called a family of brontosaurs she knew who run the Pangean Towing Cooperative, who came out and towed my defunct way-back machine to their cave garage. I’m still not sure when this is, but the natives here have been quite accommodating. Of course there’s always a fly in the ointment amber, or an unexpected dinosaur in the tar pit . . .
We were having a lovely dinner at Laughing Planet (who knew they’ve been around since the dawn of time? ), only to find there are small happy dinosaurs running about the place stealing peoples’ side dishes. This critter for example (Exhibit A, right), took a serious liking to my guacamole. 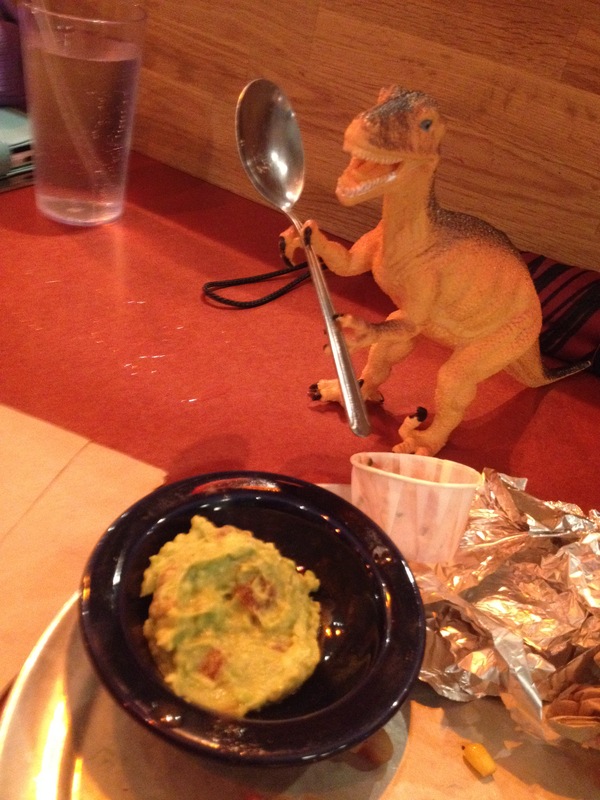 I mean, yes, I did mention earlier that I can’t really taste guacamole, but jeez, the little raptor could at least have asked before it grabbed my spoon and started snarfing it up. So, I’m thinking about making my blog a little less blog-a-day-zical. Eeek! I know right!? I mean, frankly who wants to read this much of my silly ramblings every single day? Well, other than my cats, and the other small rodents they have over when I’m not around (really guys, the tiny beer cans so give it away). Perhaps if I post 3 or 4 times a week, that will suffice to get my blog fix. I can last that long between ramblings, right? Well, uhm, okay . . . The actual truth is: I think I broke my Way-Back Machine from using it too much. I was sitting here pulling buttons and twisting levers and pushing knobs . . . wait, that doesn’t sound right. And then the cat sneezed (I so don’t want to talk about that mess) and the next thing I know I’m way outside of my “normal” blog zone. I have no idea when I am now . . . or then . . . or . . .
OMG . . . is that a pterodactyl?? One of the many seemingly random “Bits” I hope to explore in this space–my final frontier . . . is my fiction work. As if reality wasn’t suffering enough here already, hmm? By fiction I mean both screenplays and novels, perhaps even some short pieces. Like everything else that spews from my fingers, like Mork from Ork in reverse, my fiction also verges on weirdness . . . or hadn’t you noticed? I kinda like throwing normal present day people in normal settings into something a little unusual and watch what happens. Here’s one short example that randomly landed on me in a Creative Writing/Fiction class a few college terms ago. Don’t ask me what I was on at the time . . . I don’t want to talk about it. I got up, shook it off, and made my way to Tony Desilio’s lounge, determined to find the answers to my first mystery. The second would have to wait, the one with the tiny saucer that had landed in the street in front of me and gone squish. I wasn’t sure I saw that either, especially the weird ooze that leaked out. I know I shouldn’t have touched it. The blur of memories that hit me at that point don’t bear thinking about, at least until I got a drink in me. The thugs dragged me into the alley while I was distracted with that. When I arrived at Tony’s, I expected more trouble, but the goon at the door that looked like a meat locker just gave me the hairy eyeball and let me in. The weasel that shot me first was waiting in the wide foyer. I could tell they both sported big revolvers under sweaty armpits. With his other meaty paw, Dob reached toward my blouse, a flicker of something unsavory in his eyes as his fingers hovered over my cleavage. I felt that helpless thing women hate so much, for about three seconds. This truly pissed me off. I shifted and something went squish. The arm that was wrenched behind my back melted away–and reconstitute in front of me. I didn’t have time to freak out about it. Maybe later. All I knew was they were trying to do to me what they already did to my family. I could feel my anger focusing into the clenching of my relatively small fist, becoming a rock-hard ball of hate, a fist-sized boulder of it. Without thinking, I swung it up, striking Dob hard enough to send him flying off his feet. Everyone in the room was shocked, including me. I stepped past Sid’s limp form and headed for Tony’s office, my mind reeling with what just happened. Whatever it was, it didn’t stop me from my original goal. Nothing could stop me from that. Tony was going to pay. I entered and closed the door behind me. Tony swiveled his chair toward me and smiled. He didn’t seem impressed. I’d left my gun back at the office, I wouldn’t have been impressed either. I was about the same shape as a cocktail waitress. A smart one. Half disgusted, half vindicated, I dropped into his chair and stared at my hands. They looked completely normal. I had become some kind of human-amoeba thing, and I’d just digested someone alive. How do I deal with that? Frantic fighting to get control of my ship. Strange buildings falshing past, then asphalt racing up. There was an awful crash. Then a close-up of a zigzagged Michelin putting out my lights, before I could react. All I felt then on were memories of memories–also not mine. Seems aliens’ lives flashed in front of them at death, too. 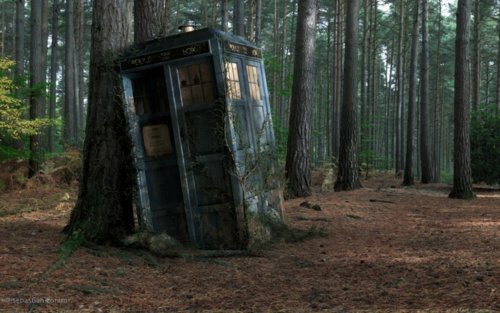 I saw the history of a world far from our own, familiar weirdness filling my human side with awe. This creature was not a monster. It had been an emissary of peace, a critter with an important mission. And as it died it came to a desperate decision. I came to my senses realizing a dead alien emissary somehow passed something of itself into a skirt-wearing P.I., who could suddenly do things to bad guys that would put her off her grain for weeks.